With nine major league starts behind him, there was some concern at the close of 1991 that a back injury might prevent Scott Kamieniecki from starting any more. "There was a little doubt back then," Kamieniecki told The South Florida Sun-Sentinel four years later. "I worked hard, and a lot of good things have happened to me since then." Kamieniecki came back from that 1991 surgery not only to pitch again, but to pitch in nine more major league seasons. He ended up pitching six of his 10 total seasons with the Yankees, his time with the team ending on a sour note, Kamieniecki having perhaps his best season the next year with his new team. 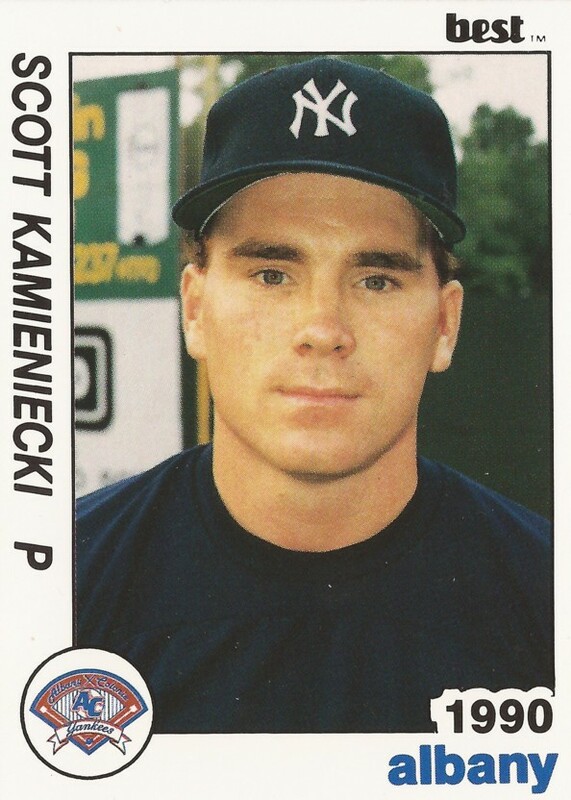 Kamieniecki's pro career began in 1986, taken by the Yankees in the 14th round, out of the University of Michigan. Kamieniecki first hit the field for the Yankees in 1987, making it to AA Albany that year. He didn't make it back to Albany until 1989, spending two seasons there. For 1991, Kamieniecki started at AAA Columbus. By June, he was in the Bronx. In nine starts, Kamieniecki went 4-4, with a 3.90 ERA. He also pitched at least six innings in each of his first seven starts. "It's hard to pitch better than he pitched today," Yankees manager Stump Merrill told The New York Times after Kamieniecki went into the eighth in one start. "His best days are in front of him." Kamieniecki returned from his off-season surgery to get another 28 starts in 1992, going 6-14, with a 4.36 ERA. For 1993, he went 10-7, then 8-6 in 1994. For 1995, Kamieniecki got into just 17 games for the Yankees. But he also got his first post-season time. He went five innings against Seattle, giving up four runs. He pitched in that game the day after learning his two young sons had started a fire, though the situation, thankfully, wasn't serious enough for him to leave, according to The Times. Then, in 1996, Kamieniecki got into just seven games, in the Yankees' championship season. But his time with the team, his decade with the organization, ended amid accusations from Kamieniecki over broken promises. For 1997, Kamieniecki signed with the Orioles. He also went out and posted a 10-6 record, with a 4.01 ERA, helping his Orioles to the ALCS. In the ALCS, he pitched eight innings over two outings, without giving up a run. Kamieniecki continued pitching in the majors through 2000, turning reliever in 1999. In 2000, Kamieniecki got into a total of 52 games between the Indians and Braves, posting a 5.59 ERA between them. It was his final season in the majors. I have lots of the 1990 Best cards but no Yankees. Hadn't seen Yankees in the set before seeing them here. They look really good in that design.